Hi! 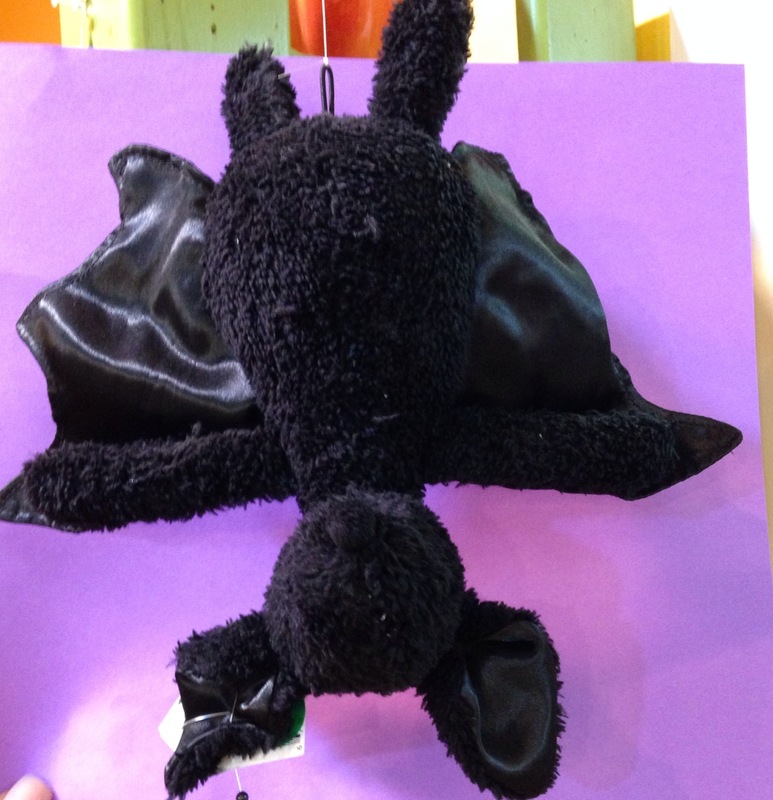 I’m Barty Bat and I’m a Jellycat critter. I love the dark, hanging upside down, brushing my fangs, and eating Cracker Jacks– there’s just something about bats and Cracker Jacks, you know? I’m looking for a good home and think that Halloween would be the perfect time for me to be adopted. I can guard your candy bowl, greet your Trick or Treaters, or I can just stay out of your hair– That’s some bat humor! Why not meet me and my Jellycat friends when you visit Kar-Fre Flowers! This is Sophia the Unicorn. 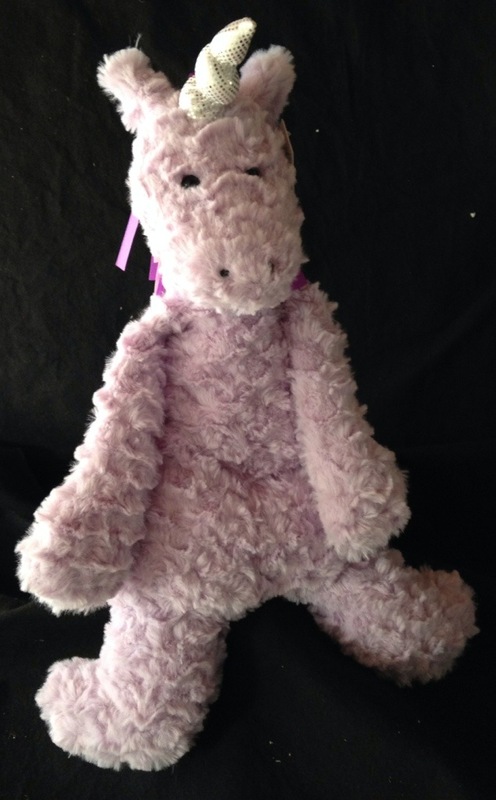 She is a lovely shade of lilac with a magical silver horn. Her mane and tail are silky satin ribbons in pinks and purples. Sophia loves eating brown sugar sandwiches, prancing, nibbling the petals of pink tulips, drinking lukewarm Earl Grey tea, and taking naps in her treehouse with the soft silver blanket her Nana made her when she was just a wee foal. Sophia also loves listening to stories, keeping secrets, and is learning to nuzzle like her great-uncle Clyde who was a champion nuzzler. If you or someone you know would like to get to know Sophia better she’s waiting for you at Kar-Fre Flowers. Yesterday, I got to cross 2 1/2 things off my Summer Bucket List and Scott, Maggie, Kent, Kris, Lucy, and Maddie joined in and seemed to have a really good time! Among my favorite things is the Farm Show on Saturday mornings on WGN radio. I love listening to Orion Samuelson and Max Armstrong and appreciating the impact that our friends and neighbors that farm have on the world economy. A few times each year Orion interviews Herb Teichman from Tree-Mendus Fruit Farm in Eau Claire, Michigan. 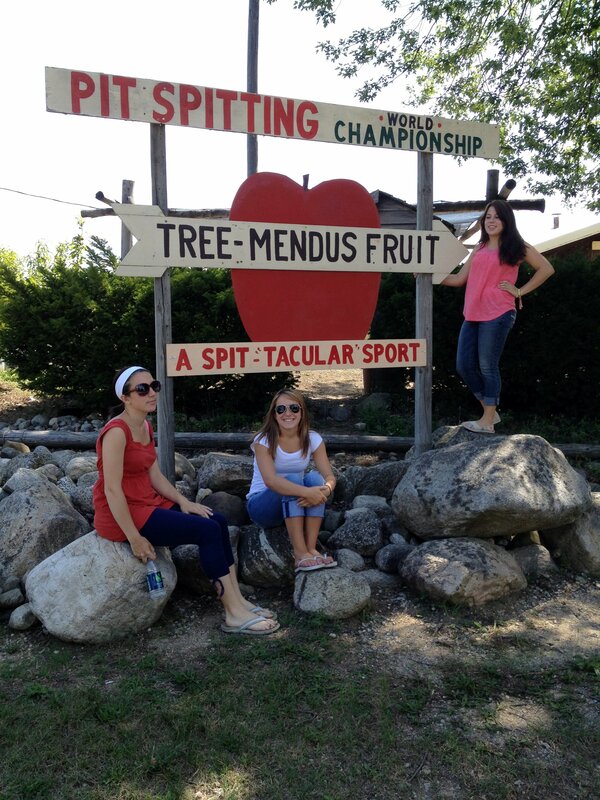 Tree-Mendus Fruit Farm grows cherries, berries, peaches, nectarines, and more and is the site of the International Cherry Pit Spit Contest. Naturally, it’s been on my Summer Bucket List for years–a family passionate about their business, ripe peaches and apricots right off the tree, and peach pie squares! Although it was a 3 hour drive from Sycamore to Eau Claire, MI the peach pie squares and the incredible fruit made it so worthwhile! 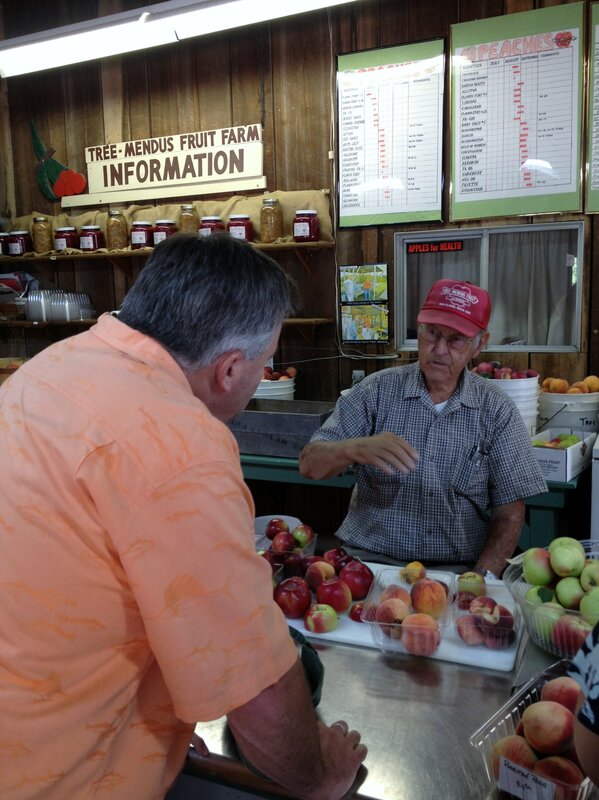 We picked delicious Red Haven peaches, but I had read that they had a variety that tasted like cotton-candy. We asked and they pointed us across the lane to a group of Saturn peach trees. Saturn peaches are a flatter, smaller peach, but absolutely the sweetest peach we’d ever tasted. One bite and you could appreciate why Saturn peaches were compared to cotton candy. I am so jealous of Kent. He got to meet and visit with Herb Teichman. 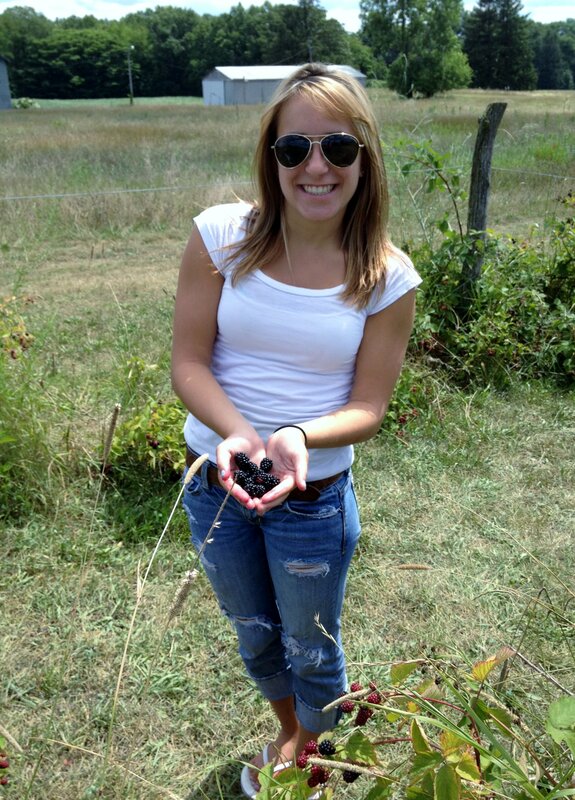 Kent learned the history of the farm, why its location makes it ideal for growing fruit, and how to best freeze a peach. Simply slice the peach, put the slices on a flat cookie sheet or plate fuzz or skin side down in the freezer until frozen. Once frozen place in freezer bags for storage. His favorite tip was on a cold winter morning toast a slice of whole wheat toast, liberally butter it with real butter, and top with some of those peach slices. I can’t wait to try it! 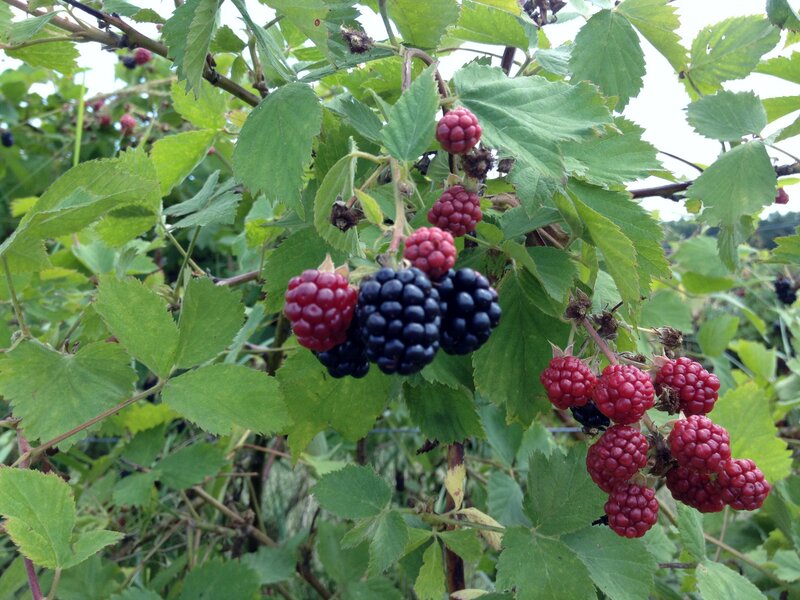 Maggie knows well the story of the Little Red Hen so she made she sure she helped pick blackberries so she’d be able to enjoy some Blackberry Cobbler in the days to come. Once again, I am sharing my epic love for Stop 50 Wood Fired Pizza in Long Beach, Indiana. This is an act of generosity, for I live in fear of a day when I cannot get in. I visited Pizza Bianco in Scottsdale, a Southwest cousin of Stop 50, and there was a 2 hour wait. If you go, tell Chris and Christy- the nicest couple ever to buy a farm, build a pizza oven, chop a zillion trees to stoke it, and present deliciousness on a daily (well, not really- they close for the harshest part of winter) basis. The featured salad is the best caprese you will ever experience, and the pizza specials are always a revelation. I cannot let go of my pistachio-prosciutto love, and Steve is a sausage mushroom. Oh, the crust, oh the crunch. I want one NOW. They make home made soup, gelato and three epic desserts: wood oven style s’mores, a baked gooey banana and the Biga Donut-pizza dough smeared with nuttela that puffs up and melts in your mouth. I want all of those right now, too. Go. My peanut allergic grandson went there and they totally sanitized the oven to keep him safe. They are that wonderful. So we’ve crossed Tree-Mendus Fruit Farm and Stop 50 Wood Fired Pizza off my Summer Bucket list. What was the half? 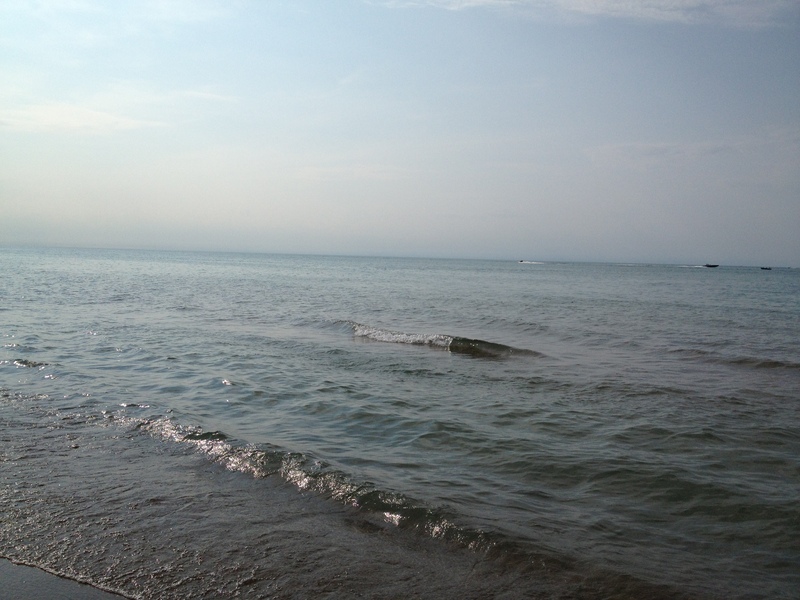 I’ve always wanted to visit Indiana Dunes and even though we were stuffed with pizza, Biga Donuts, and S’mores, kind and patient Scott and Kent stopped so Kris and I could walk to the beach and see Lake Michigan. We weren’t there long, but it’s been moved to the top of my Summer Bucket List! As promised yesterday, a peek into our Design Room. Thankfully, a bowl of cantaloupe melon has my stomach content and we can get back to the important Kar-Fre focus! 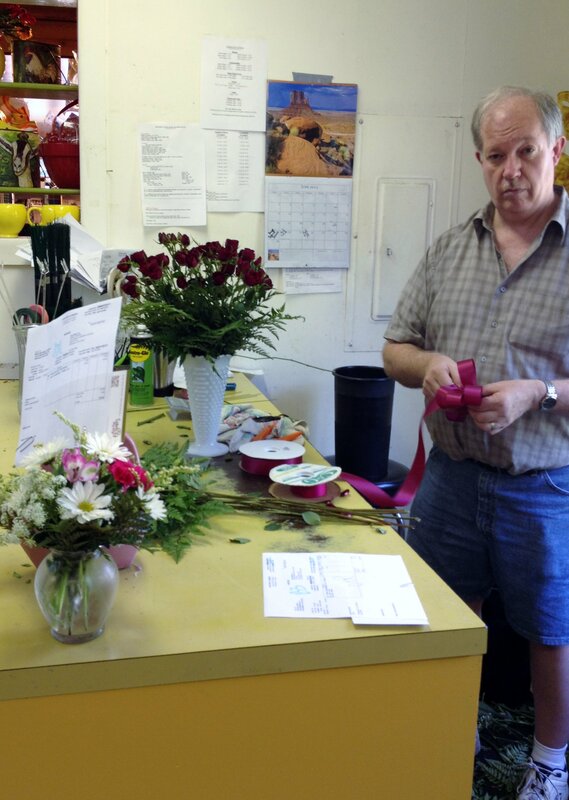 Rod’s busy creating beautiful fresh flower arrangements to be placed for sale on the shelves in our cooler. We’ve been tickled to see folks stopping to pick up a bouquet to take home or to take as a hostess gift. Last night a gentleman stopped in near the end of the day and chose a bouquet that we wrapped in a cellophane to make extra-special. While we were wrapping his bouquet, he chose one of our greeting cards to tuck in with the bouquet. As he left with his gift, he shared how his Kar-Fre gift was so much better than anything he could have found at a grocery store. We LOVE those kinds of comments! Julie is busy getting us organized for our weddings this weekend. 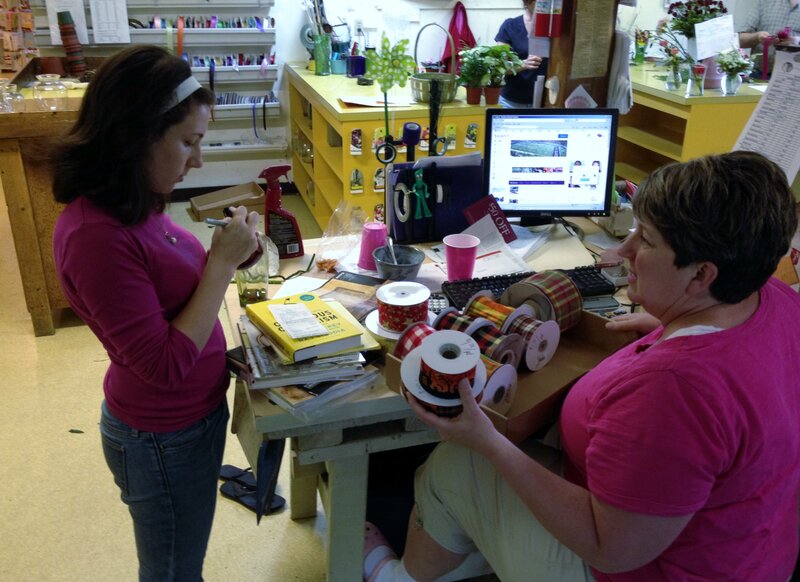 She goes over each of the orders to check ribbons, delivery instructions, and create tags for each of the flowers so when they are delivered our delivery staff and the wedding party know what each arrangement is for. In this picture Julie was finishing creating dish gardens that are for sale in our conservatory. 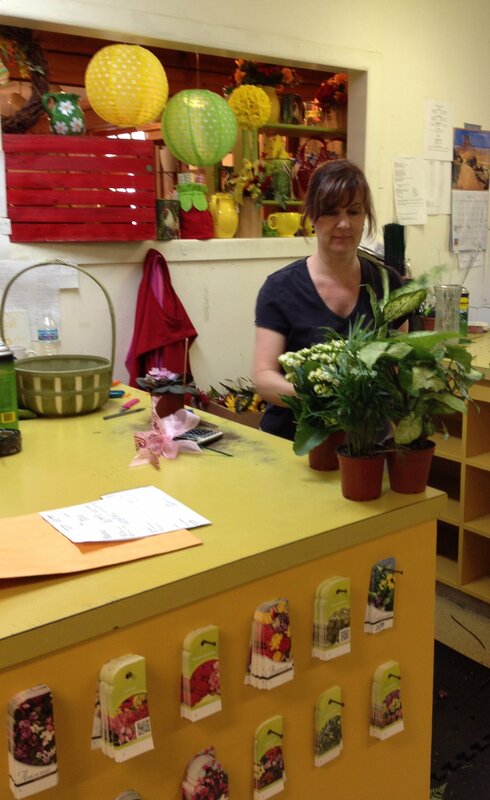 All of Kar-Fre Flowers’ dish gardens are made by hand and never bought from an outside supplier. 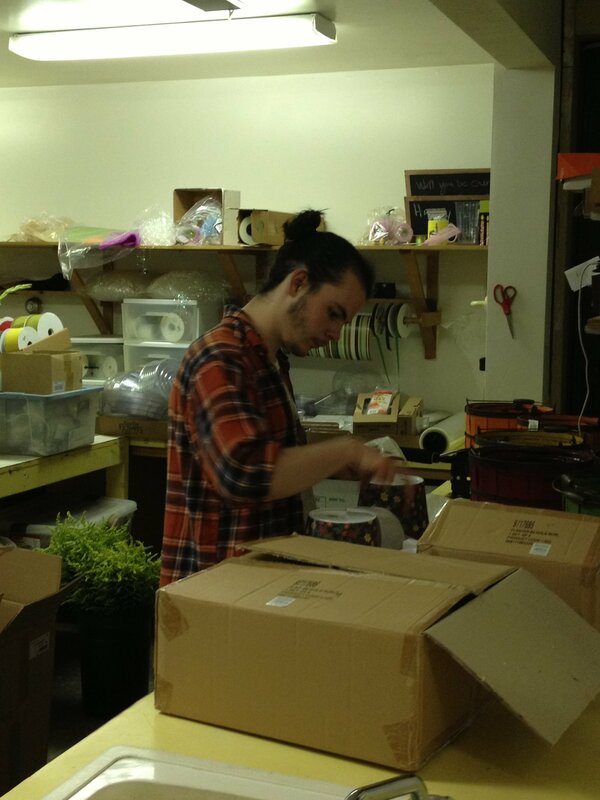 Noah has been busy most of the day cleaning and organizing our coolers and processing our shipments of fresh flowers that have arrived today. Now, Noah is pricing oodles of new merchandise that has arrived today… some fall, some Christmas, and some that’s going out on display soon! 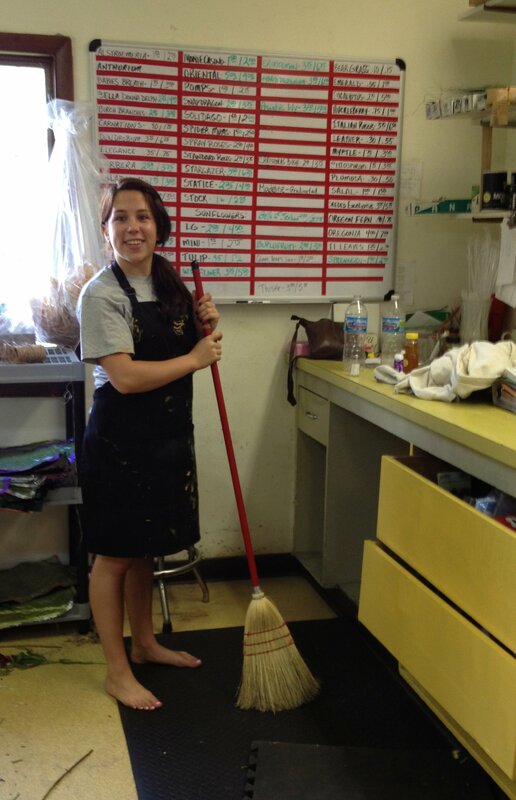 Maddie is busy cleaning and repainting our design room this summer! It’s been in serious need of an overhaul and we’re loving the fresh yellow paint that’s making our design room an even happier place to be! Among the new goodies that have arrived are bolts of ribbon. Here are Kris and Lucy bring the bolts and discussing where to pack away the Christmas ribbons, the fall ribbons, and which ribbons need to be added to our ribbon rack. Greetings from Healthy Eating, Day 13! For over a year now I have focused on eating healthier and becoming more physically active. Last April with the support and camaraderie of some good buds, I took up running and last October completed a 10 mile race with Kyle and his girlfriend, Jessica. I’ve lost over 50 pounds and feel great, but there are still plenty of days that this is not easy. Lately, I have felt like I was slipping back into my bad habits so in order to regain my focus I’ve registered for the Springfield, IL Half-Marathon and shook up my eating plan in order to hopefully lose 25 more pounds by the end of summer. I am now 13 days into My New Focus and this morning when the scale and I met I had gained one pound. Before you try to assuage my frustration with your talk of water or muscle gain, please know I am down from the 4 pounds that I had gained as of last Saturday. So rather than encourage me to try harder, that crummy, stubborn, clingy 1 pound has made me feel so hungry today… I am literally ready to gnaw my arm off. I’ve eaten all of the healthy good stuff in my lunch bag. I’ve drunk 50 ounces of water. I have chewed gum. I have tried staying busy. I have tried focusing on my breathing. I have to admit I’m not sure how that works because the entire time I’m breathing, in the back of my mind I’m thinking: Culver’s Flavor of the Day is Cashew Caramel, Sorrento’s has prime rib on special tonight, and it’s Creamed Chicken night at Parkway, and I wonder if there’s still a Reese’s Bar on the shelf by the back door. Why is this so darned difficult? Today’s post was to be about the beautiful arrangements being created in our design room, but instead today’s post will be from our special guest blogger, my Stomach. My List of Demands and no one cares about that scale. Confectionary chocolate covered strawberries. This a fruit. It’s is healthy. Cape Cod Kettle Cooked Potato Chips. This is a vegetable. It is healthy. Parkway’s Dream Cake. It is light, it is fluffy. How bad can all that air be? MVP’s Cajun Potato Salad. Again, it’s a vegetable! Taxco’s Margaritas. It’s been a tough day, we deserve one. Pizza Villa Beer Nuggets. If you’ve had them , no explanation is necessary. If not, let’s go get some! Sunshine Scoop Ice Cream. You get 10% off your order with your receipt from Pizza Villa. Dairy Dogs Twist Ice Cream Cone. Yes, with eyes! A nap to savor all of the above deliciousness and because exercise is so over-rated. Thanks to Stomach for today’s post and join us tomorrow for pictures from the design room. This is our Daisy Crazy bouquet. 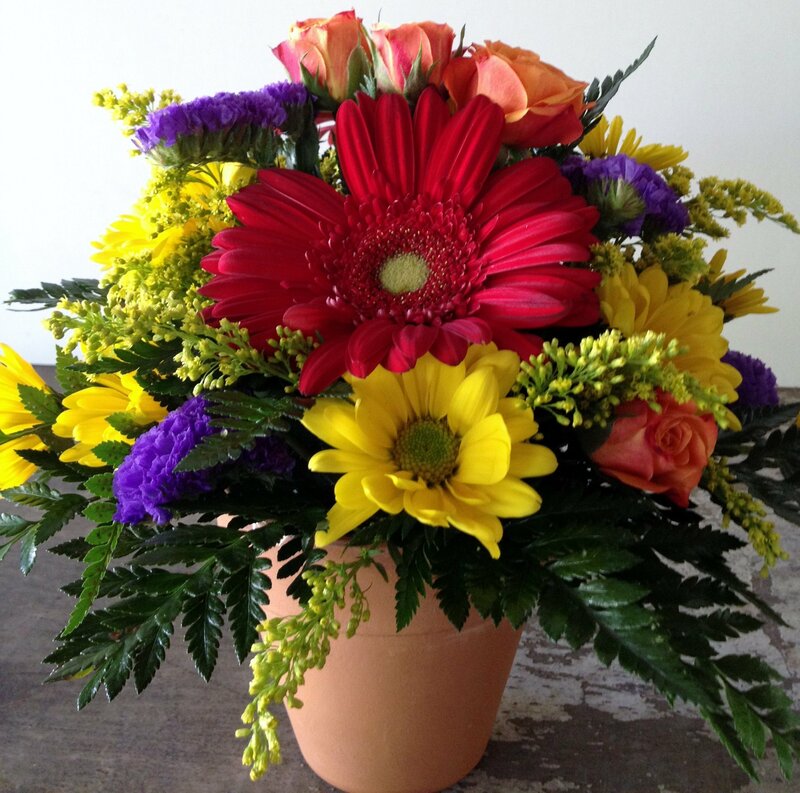 It features a fun mixture of spray roses, statice, solidago, and befitting its name– gerbera daisies and daisy mums. This bouquet is arranged in a reusable terracotta pot. 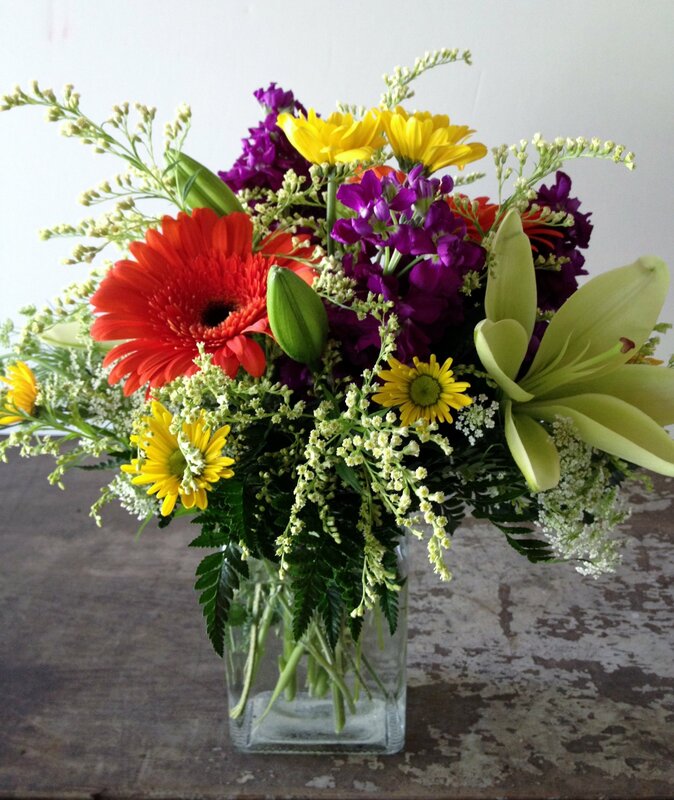 This mix of colors and flowers is sure to bring a smile so of course we call it our Summer Smiles bouquet. 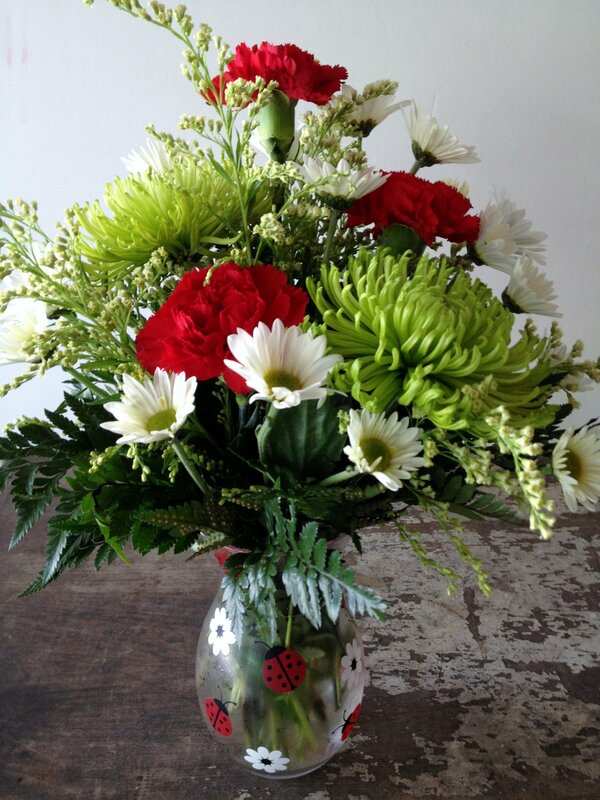 It features a mixture of long-lasting daisies, spider mums, carnations, solidago in a keepsake ladybug vase. Arranged in a trendy clear cube vase, our Bouquet Bliss features a festive mixture of lilies, gerbera daisies, stock, solidago, and daisy mums. Dad is sure to love our Full of Happiness bouquet. 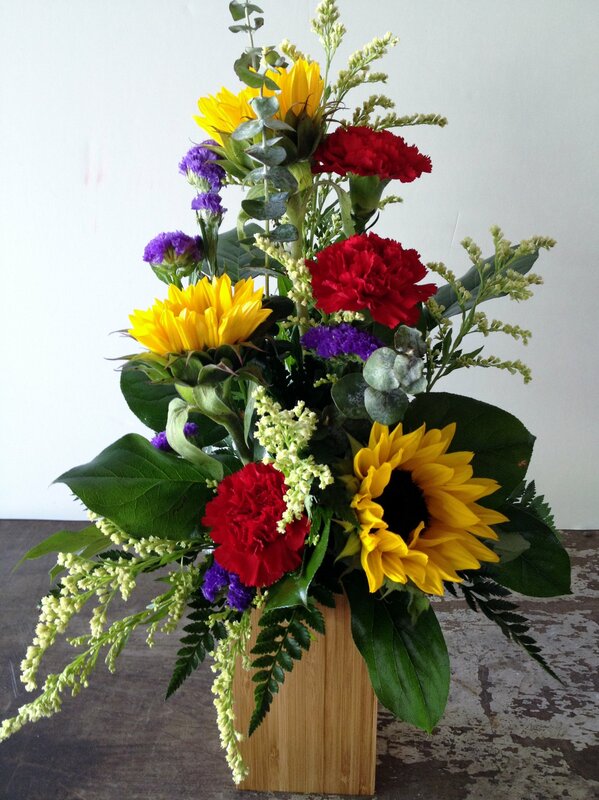 We’ve taken a happy mix of sunflowers, solidago, carnations, statice, and greenery and created this bouquet in a bamboo container. Don’t forget Kar-Fre Flowers has a unique selection of Father’s Day greeting cards that make any gift even more special. Your Dad will appreciate that you remembered him! While you might think this post is about our Maddie being punished, it’s really about the nationwide helium shortage. 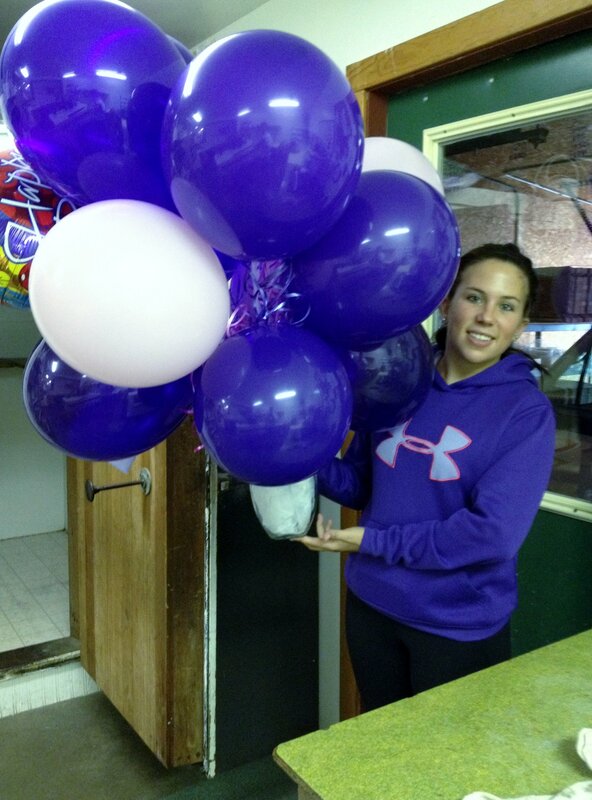 Kar-Fre was aware of the shortage and had stockpiled tanks of helium, but we ran out in early November 2012. Our suppliers told us then that the helium that was available was reserved for medical facilities to cool their MRI machines and large construction jobs. Our suppliers thought by early 2013 there would be helium available for everyone. We’ve been checking monthly and are now being told that by late 2013 there may be helium available for our use. Until helium does become available our mylar and latex balloons are air-filled, and while they don’t have the fun floating effect, they do create a pretty bouquet like in the picture above. Where is the helium? It’s been interesting to learn that helium is quite plentiful and is second only to hydrogen in its availability on earth, but helium is a by-product of natural gas and when those prices declined so did production of natural gas and helium. Then much like gasoline prices, there have also been issues with plant shutdowns for maintenance, plants being shutdown due to wildfires, and natural gas plants overseas slowing production due to lower natural gas prices. According to an article in Popular Mechanics, the United States once had a huge reserve of helium until Congress decided to privatize the program in 1996 and sell off all reserves by 2015. Congress assumed that new helium sources would be developed in the interim. Not surprisingly, the reserves have dwindled and until recently no new sources of helium production had come to the forefront. While new production plants have finally been built it will be a few years until production returns to normal. Until then the balloon industry has been— grounded. Be our Bud on Facebook!